Drinking-water supplies from the Potomac-Raritan-Magothy aquifer system at the Puchack well field in Pennsauken Township, Camden County, New Jersey, have been contaminated by hexavalent chromium—the most toxic and mobile form—at concentrations exceeding the New Jersey maximum contaminant level of 100 micrograms per liter. Also, scattered but widespread instances of volatile organic compounds (primarily trichloroethylene) at concentrations that exceed their respective maximum contaminant levels in the area’s ground water have been reported. Because inorganic and organic contaminants are present in the ground water underlying the Puchack well field, no water from there has been withdrawn for public supply since 1998, when the U.S. Environmental Protection Agency (USEPA) added the area that contains the Puchack well field to the National Priorities List. As part of the USEPA’s investigation of the Puchack Well Field Superfund site, the U.S. Geological Survey (USGS) conducted a study during 1997–2001 to (1) refine previous interpretations of the hydrostratigraphic framework, hydraulic gradients, and local directions of ground-water flow; (2) describe the chemistry of soils and saturated aquifer sediments; and (3) document the quality of ground water in the Potomac-Raritan-Magothy aquifer system in the area. The four major water-bearing units of the Potomac-Raritan-Magothy aquifer system—the Upper aquifer (mostly unsaturated in the study area), the Middle aquifer, the Intermediate Sand (a local but important unit), and the Lower aquifer—are separated by confining units. The confining units contain areas of cut and fill, resulting in permeable zones that permit water to pass through them. Pumping from the Puchack well field during the past 3 decades resulted in downward hydraulic gradients that moved contaminants into the Lower aquifer, in which the production wells are finished, and caused ground water to flow northeast, locally. A comparison of current (1997–2001) water levels near the site of the former pumping center with data from previous investigations indicates that, since pumping at the Puchack well field ceased, the dominant local ground-water flow direction is to the southeast, aligned with regional flow. Chromium concentrations were highest (8,010 micrograms per liter in 2000–01) in water from the Middle aquifer immediately downgradient from a possible source; the extent of this chromium plume is unknown but appears to be small. A second, unrelated, localized chromium plume also was identified in the Middle aquifer. The Intermediate Sand was found to contain an areally extensive plume of chromium-contaminated water, with concentrations up to 6,310 micrograms per liter in 2000–01, and another plume of about the same size, with concentrations up to 4,810 micrograms per liter in 2000–01, was identified in the Lower aquifer. The previous USGS investigation indicated the approximate extent of the combined plumes; the current delineation indicates that their locations have shifted slightly to the southeast since 1998. Concentrations of chromium in ground water decreased at some well locations by as much as 60 percent between sampling rounds in 1997–98 and 1999–2001. The decrease in chromium concentration at a given well could be the result of the chemical reduction of hexavalent chromium and precipitation of the resulting trivalent chromium, the sorption of hexavalent chromium to aquifer materials, or the physical movement of the plumes. Available data indicate that all three processes likely have affected concentrations. The distribution of hexavalent and total chromium in the soils and sediments of a possible source area indicates that some hexavalent chromium has undergone chemical reduction in the soils, but the degree to which this process takes place in the aquifer currently is not known. Nor is it known whether contaminated soils continue to contribute chromium to the aquifer system. Contamination by volatile organic compounds (VOCs) is more widespread in all water-bearing units of the Potomac-Raritan-Magothy aquifer system than is contamination by chromium, but coherent plumes of organically contaminated ground water have not been identified. The variety of compounds present and their widespread distribution indicate that the VOCs likely have multiple sources. Inorganic (chromium) and organic contaminants are commingled within the areas of the chromium plumes, but the sources of organic contamination are not necessarily associated with the source(s) of chromium. Concentrations of VOCs have declined at several locations since 1997–98. Compounds such as 1,2-dichloroethylene and vinyl chloride, which may be degradation products of more highly chlorinated solvents, are present. The geochemical environment in the Lower aquifer tends toward being suboxic; this likely promotes reductive dechlorination of the highly chlorinated compounds. Because all possible sources of organic contaminants have yet to be identified, it is not known whether such sources continue to contribute contaminants to ground water. 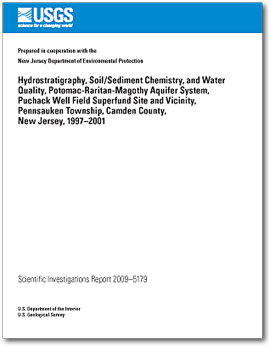 Barringer, J.L., Walker, R.L., Jacobsen E., and Jankowski, P., 2011, Hydrostratigraphy, soil/sediment chemistry, and water quality, Potomac-Raritan-Magothy aquifer system, Puchack Well Field Superfund site and vicinity, Pennsauken Township, Camden County, New Jersey, 1997–2001: U.S. Geological Survey Scientific Investigations Report 2009–5179, 303 p.